Khaitan is the name that's attached to one's childhood memories, but with the fans. The range of other products, have implanted the same amount of quality that came with the range of fans. 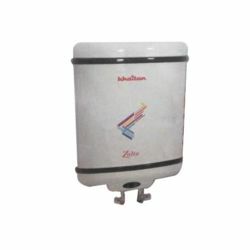 Khaitan's 25 Litre Zolta Geyser, sets best in the requirement of homely use. The geyser is designed in a peculiar manner, to look good and not acquire much of the space in bathrooms. It comes with a good capacity of 25 litres; while on the same time doesn't weigh excessive. Winters could never be fun and cozy, without the warmth of that warm shower. Khaitan's Zolta Geyser is here to serve the same purpose! Winters are great time to love sun. But that chilling water turns a foe, to our skin. Turn this foe into a friend; with the range of geysers available in here! Khaitan is the name that's attached to one's childhood memories, but with the fans. The range of other products, have implanted the same amount of quality that came with the range of fans. Khaitan's 25 Litre Zolta Geyser, sets best in the requirement of homely use. The geyser is designed in a peculiar manner, to look good and not acquire much of the space in bathrooms. It comes with a good capacity of 25 litres; while on the same time doesn't weigh excessive. Winters could never be fun and cozy, without the warmth of that warm shower. Khaitan's Zolta Geyser is here to serve the same purpose!Winters are great time to love sun. But that chilling water turns a foe, to our skin. Turn this foe into a friend; with the range of geysers available in here!